At the beginning of my career, I found so many wonderful instruments in museum collections and it seemed impossible that men living in earlier times could have built such things without the aid of our modern tools and techniques. I felt that I lacked their skills and very often, while I was putting an instrument together, I asked myself how, for example, Pages or Torres might have done such a thing. So, for a number of years, I read a lot about the history of woodwork and tried to reproduce old methods until I reached the point when I felt free to come out from under the shadow of these great makers of the past and build my own instruments in my own style. Torres himself (among others) was a very curious and experimental maker, and I believe I fit well into the legacy they left us of learning, experimenting and trying to improve. There were many technological developments through the course of the 20th century and I wanted to know about some of the newer possibilities that had opened up for instrument makers. So, apart from making guitars, quite a lot of my time (perhaps too much) has been spent in research. The only way to find out how materials sound is to make something with them and see (well, in this case hear). 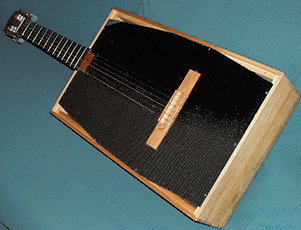 Influenced by the work of Greg Smallman, I started working with balsa wood and carbon fibre in 1985. I believe I was one of the first musical instrument makers in Europe to do such a thing. I believe I was the first person to call the system “lattice bracing” in the course of conversations with John Williams. At one time, I wanted to find alternatives to tropical hardwoods in guitar-making. Violin makers, for example, produce superb instruments, working mostly with native woods. In cooperation with Jack Davies, I developed an eco-guitar that we both agreed preserved the quality of tone and appearance. Since then, I have offered guitars with bodies made of fruitwoods, yew and maple. At some other time I felt my lack of knowledge and experience with modern technologies and new materials was confining. So I went to Imperial College to work as a researcher in microtechnology. It is a source of great pride that my signiature, etched into a silicon wafer along with all the members of the team, now resides on the surface of the planet Mars. By the late 1990s, it was getting so time-consuming to listen to all the things I had in my head, that I built “Wilma” (see picture to the right) to get through soundboard tests more quickly. You can simply screw the soundboards into the “body”. You can also take off the back panel and work on the soundboard from behind, even while it is strung. “Wilma” has had many soundboards, from aluminium, laminates of various woods, including balsa wood, together with Nomex paper, polyurethane foam and carbon fibre. Some of these materials came from the ideas of other makers, like Matthias Damman and Gernot Wagner. The carbon fibre/PU foam came from the work of Eaton Racing Boats (unfortunately no longer in business). Many of these laminates remain curiosities, but from each one you learn. These experiments led to the “Q Series” guitars. One of the most interesting things I learned was that you can shape the sound of different materials to such an extent that trained guitarists can often not hear the difference between wood, metal and synthetic fibres. That realization is quite humbling, but also suggests that many different methods and materials may still lead to results that are beautiful both visually and musically. Around the year 2000, I became interested in glass, but there was already a glass violin in the world, so I never tried to build a glass guitar. However, I realized that we are nearing a time when you might do wonderful things with synthetic diamond or carbon nanotubes. Unfortunately, the technology is still rather young, so it will remain something for the future. It is not yet practical to manufacture large sheets of diamond, but in 2005, I actually held a 1kg bag of carbon nanotubes – this manufacturing technology is just on the edge of commericial production, much like carbon fibre was around 1980.